This upscale boutique hotel is located in the Victory Park district of Dallas, Texas. A rooftop infinity-edge swimming pool and 24-hour concierge service are featured on location. Enjoy dining at Craft restaurant, located on-site and featuring a contemporary menu created by the famous award-winning chef Tom Colicchio. The restaurant offers a variety of dishes for breakfast, lunch and dinner, created with only the freshest seasonal ingredients. Relax with a cocktail at the trendy Ghostbar or listen to live DJs and enjoy martinis at the Living Room Bar, both located on-site. 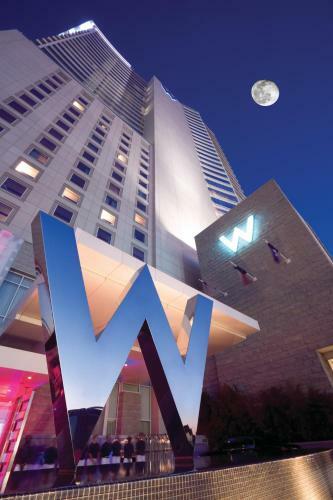 Nestled deep in the heart of Dallas city centre in the upscale Victory Park neighbourhood, only moments from major attractions, this luxurious hotel features exceptional accommodations along unrivaled amenities and services. Discover spacious guestrooms furnished with all the latest technologies, including flat-screen TVs and iPod docking stations at W Dallas Victory. Relax with a massage from the full service on-site spa, or enjoy stunning views from the 16th floor infinity pool. Work out in the state-of-the-art fitness centre, or make any dream a reality with the hotel's Whatever/Whenever service. Find luxury shopping at Highland Park Village, stroll through the Uptown neighbourhood, or experience the high-fashion Design District, all located close to the Dallas Victory W. World-renowned restaurants, museums, art galleries and a vibrant nightlife are also only moments away. W Dallas Victory Residences offers luxury Dallas High-rise residential living with dramatic interiors, city views, and luxury amenities in Victory Park, Dallas.